^ Script error: The module returned a nil value. It is supposed to return an export table. ↑ Script error: The module returned a nil value. It is supposed to return an export table. 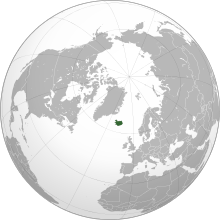 Section VI deals with religion and Article 62 states "The Evangelical Lutheran Church shall be the State Church in Iceland and, as such, it shall be supported and protected by the State". In English this church is commonly called the Church of Iceland. ↑ ४.० ४.१ ४.२ ४.३ Script error: The module returned a nil value. It is supposed to return an export table.